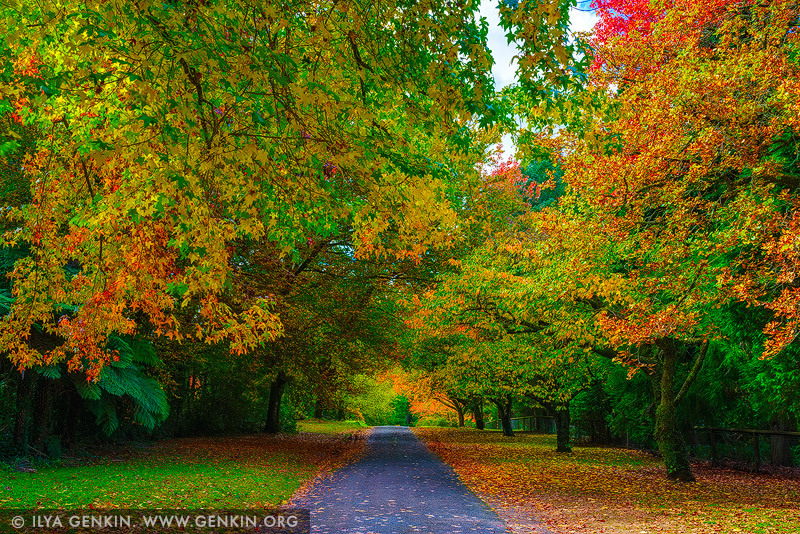 Mount Wilson, a Blue Mountains village, is famous for its historic properties, gardens and stunning autumn colour. Gardens in Mt Wilson are so beautiful that even were used as filming locations for Baz Luhrmann's The Great Gatsby. Some gardens are open to public. While Autumn and Spring are the best times to visit open gardens in the Blue Mountains, you will find a number of gardens open to the public at anytime of year. This image belongs to the travel and nature stock photo library. This stock photo of Autumn in Blue Mountains is available for licensing for commercial and editorial uses including websites, blogs, books, magazines, brochures and advertising. Restrictions may apply for images which contain third party copyrighted material or sensitive subjects. Photos of artwork are for editorial use only. This image id AU-MOUNT-WILSON-AUTUMN-0003 of Autumn in Blue Mountains, is copyrighted © by Ilya Genkin. This is not a public domain image.